Alberta and other regions throughout Canada are experiencing a public health crisis related to increasing misuse of synthetic opioids such as Fentanyl. In response to this change, Alberta Health Services (AHS) has worked with Alberta Health and other stakeholders to develop a provincial naloxone strategy for Medical First Response (MFR). With the increased prevalence of opioid overdose in Alberta communities, MFRs can substantially contribute to positive patient outcomes when their skills providing supportive care measures such as airway maintenance and ventilation assistance are combined with the administration of naloxone. Alberta Health has made regulatory changes over the last year to increase public access to naloxone and to increase the number of health professionals who can administer naloxone to someone who is experiencing an overdose. Further changes were announced Feb 7, 2017, including Ministerial Orders that permit non-regulated first responders such as firefighters and law enforcement to carry and administer naloxone to patients. 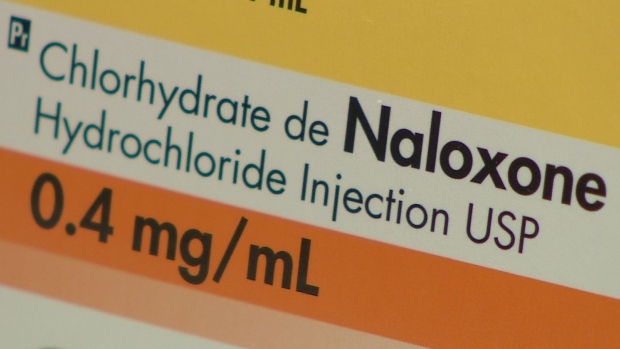 A survey conducted among MFR Agencies throughout the province indicated 91% of respondents are in favour of carrying naloxone for administration to patients. It was also clear that both the Intramuscular (IM) and Intranasal (IN) methods of administration are strongly desired. Use of naloxone is supported by the Medical Oversight and Quality Assurance processes in place with the Alberta MFR Program. This includes an updated Medical Control Protocol outlining when naloxone should be administered as well as the Patient Care Record documenting the use of naloxone. IM Injection naloxone kits are supported and funded by Alberta Health as part of the Take Home Naloxone (THN) Program. THN Kits for IM injection (including replacement kits) are available at no charge to agencies enrolled with the Alberta MFR Program. IN naloxone in the form of NARCAN® Nasal Spray is a “no needle” alternative and MFR Agencies choosing the IN option can order nasal spray units directly from the manufacturer at their own expense. As part of a commitment to support MFR partners, the MFR Program will reimburse MFR Agencies for the cost of NARCAN® Nasal Spray units that are administered to a patient. While there is a lot of focus on naloxone, it is important to remember it is not the first line of patient care. We want to emphasize that MFRs at all levels of training are already able to treat suspected opioid overdose by providing critical airway and ventilation assistance. Naloxone can be very beneficial for patients when administered appropriately but it does not replace other supportive measures.